Are you experiencing hair loss and finding yourself becoming increasingly aware of your lack of hair? Are you interested in a hair loss treatment that does not require surgery or have a recovery period? You may be a candidate for the hair loss treatments offered at Glow MediSpa! One of our most common treatments for hair loss is the use of platelet-rich plasma (PRP) to repair and regenerate damaged hair follicles and stimulate circulation in the treated areas. PRP contains high levels of platelets, the cellular structures that are responsible for the repairing and restoring damaged tissues, and helps create new blood cells to improve circulation and deliver important nutrients to damaged hair follicles. This autologous treatment uses your own blood to create the PRP that is injected into the areas of hair loss, so there is very little chance of an adverse reaction. You may experience some mild tenderness in the treated area for the first few days following your injection session, but any discomfort can be managed with over the counter pain medication or cold compression. In addition to our PRP Hair Restoration treatments, we also offer treatment with Nutrafol supplements and topical prescriptions for patients who qualify. Find out if you are a candidate for the hair loss treatments offered at Glow MediSpa. Contact one of our offices in Seattle today for further information or to schedule a consultation! This oral supplement is comprised of nutraceutical ingredients that are designed to work in combination to target various causes of hair loss, including hormones, inflammation, and stress. Stress and inflammation are two factors that are not commonly addressed in hair loss treatments, but they can be the main cause of thinning hair or hair loss. By creating a supplement that targets all of the major causes of hair loss, Nutrafol is able to provide a solution for a wide range of patients and help improve the overall health and quality of the hair. Nutrafol is specifically formulated to treat all these potential causes and strengthen and nourish hair from the inside out. 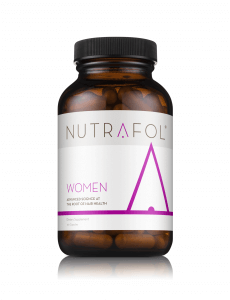 Nutrafol comes in a formula specifically designed for men and a separate formula designed for women, to accommodate the needs of both men and women experiencing hair loss. BCM-95 Biocurcumin: extracted from turmeric, this antioxidant helps reduce inflammation that can result in slower hair growth. The experts at Glow MediSpa may also provide you with a topical prescription to boost hair growth and treat hair loss. We offer different options for our male and female patients, and not every patient who is experiencing hair loss may qualify for a topical prescription. For male patients who qualify, we can provide Rogaine™ and Propecia™, and for our qualifying female patients we offer 7% minoxidil and 0.2% progesterone. Are you interested in learning more about the hair loss treatments offered at Glow MediSpa? Contact one of our offices in Seattle today for more information or to schedule a consultation with a member of our team. We look forward to hearing from you!